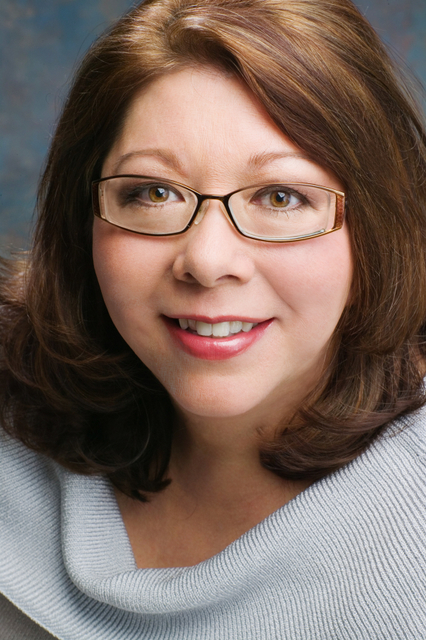 It's my pleasure to welcome award-winning author Linda Joyce to The Romance Dish! A military child who traveled the world courtesy of the United States Air Force, Linda soaked up the educational opportunities her lifestyle provided. Her very first manuscript was written while living in Japan. Linda has taken advantage of a variety of experiences during her life, including taking flying lessons, being a hairdresser and learning to grill a steak to perfection in her role as part-owner of a steakhouse. These days, she lives in Atlanta with her husband and dogs, General Beauregard, Gentleman Jack and Masterpiece Renoir (don't you just love those names?) and spends her time writing. Her book, BAYOU BORN is available in print today. 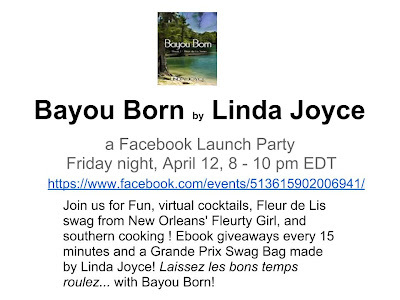 Linda is also hosting a Facebook Launch Party with lots of fun and giveaways, tonight from 8-10pm EDT. Check out the details in the invitation at the end of this post. Branna Lind's self-esteem rests at the bottom of the Mississippi River. She canceled her "wedding of the decade," though she isn't saying why. She wants life on her own terms: no ready-made job in the family business, no safety net of close-knit kin, and no more betrayal. College professor James Newbern prizes his bachelorhood. Experience has taught him beautiful women are high-maintenance trouble and Branna fits that type. He is happy to avoid her until the college vice president assigns him to mentor the newest hire—Branna. Branna is on her way to a new life, but will the scars of the past send her running from love? Even if she stands her ground, can she convince James that she truly is his "type"? Please give Linda a warm welcome! Hey there! I’m excited to share some “insider secrets” about Branna and James. Let me know if you are *surprised* by anything that I am about to reveal. I would love to hear from you! What or who inspired the Fleur de Lis "keeper" position? At Fleur de Lis, the stories of the past and the traditions are entrusted to Branna. She must “keep” them and Fleur de Lis to ensure future generations understand their heritage. It is a big responsibility. What inspired James Newbern as a university professor? I met a very engaging man, an alumnus of my alma mater, who told me that he was an anti-statistic. He’d dropped out of high school, taken the GED, so he could enroll sooner in college. I liked the idea of a having a hero who is more than what he seems. James isn’t the stuffy-professor type, and he’s a Cracker at heart. Some authors put their pets in their stories. Are any of your dogs in Bayou Born? I am a big lover of dogs. I started to say, “A big dog lover,” but then that would insult my seven-pound Papillion, Masterpiece Renoir. Yes, one of my three dogs is in Bayou Born. General Beauregard. 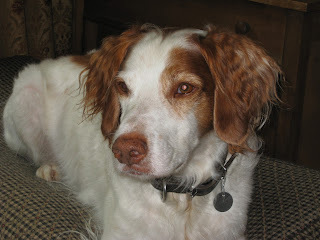 “Beau” is my Brittany spaniel. While he’s a good bird-hunting dog, he only hunts a few days a year. The rest of the time, he’s my pet. Though, secretly, he thinks I’m his pet. He is the largest of my three dogs weighing close to fifty pounds. Also, more than the other two, he loves to cuddle. If you were a travel agent sending someone to your hometown, what would be the top three sights you'd want them to see? Ohhh. I have to break this one down into categories and could list many things for each one. Historical spots. Food delights. Music mojo. And, modern marvels. History: The French Quarter has many hidden gems. I recommend The Cabildo, a museum that highlights the rich culture of Louisiana. There are nationalities beyond the French and Spanish that influenced the development of New Orleans, such as the Germans, the Irish, and African Americans. Food: It’s everywhere. From Po’boys, to beignets, to five-star cuisine. The Praline Connection has my favorite pralines in the city. Music mojo: Preservation Hall is a musical must. However, some of the best sounds come from the sidewalk musicians. Modern marvels: One place: Mardi Gras World. What conferences will you attend this year? for Bayou Born because that’s where the writing began. I have so many wonderful supportive friends there and want to celebrate with them. And RWA Nationals, because it’s in Atlanta this year, in July. I LOVE Tremé, an HBO show which will air its fourth and final season this year. http://www.hbo.com/treme/index.html It shows the music, food, history, and the struggles of New Orleans after the storm. I’m sad that it will end. I also love Downton Abbey, The Big Bang Theory and cooking shows. Do you have a fear of thunderstorms like Branna? Yes! I went to high school and college in Florida. Florida is the lightning capitol of the US. Frequently in the Florida news, someone’s been struck and killed by lightning and there wasn’t even a storm nearby. When I worked in Tampa on the 5th floor of a high rise, I was lucky to have a windowed office. Lightning struck the corner of the building right by me. I had a little toy that made sounds sitting on the windowsill. It literally blew the gizmo apart. Others down the hall heard the sound and came running. Let’s just say I have a healthy fear of lightning. I have enjoyed my time with you. 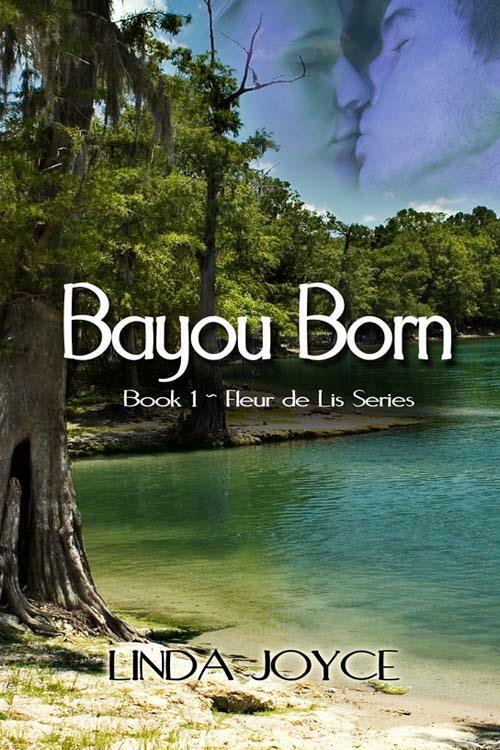 I sincerely hope you’ll enjoy Bayou Born. Do you have a fear of thunderstorms? If you have pets, do they head for cover when lightning flashes and thunder rolls in? How do you counter your fear? How do you help your pets overcome their fear? 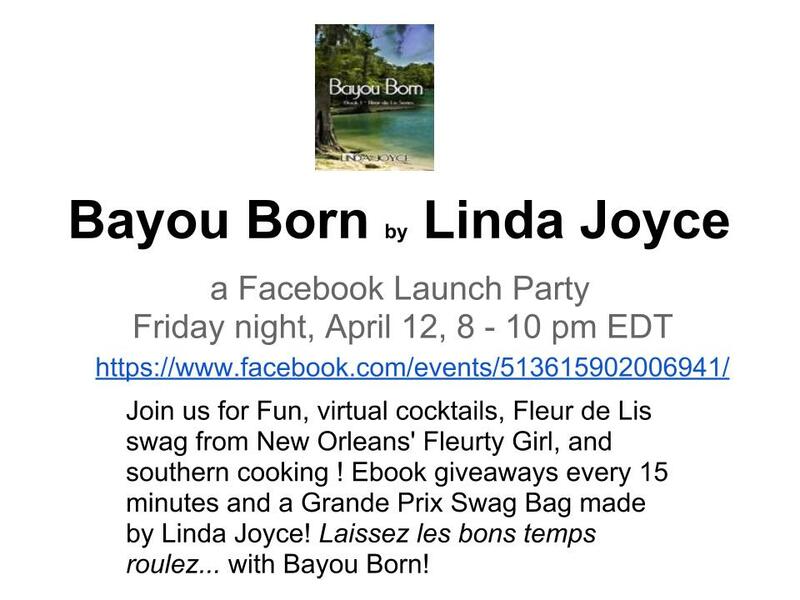 Linda is giving away a Kindle copy of Bayou Born to one randomly chosen person who leaves a comment! I really love to hear from readers. Let’s connect! Congratulations on your new release, Linda! It was a pleasure reading your guest blog today at TRD! Speaking of thunder storms, we had bad ones last nights in Atlanta. Beau isn't bothered by them, but he hung by my side to protect me. Jack and Renoir made a sandwich of me on the couch. Looking forward to chatting with folks today and hope everyone will stop in at the launch party tonight! Not just for a chance at a free copy, but also to say what a nice interview this was. I learn something new about Linda each time :-). Bonjour, Linda. It's always good to visit with another Louisiana native. Congrats on Bayou Born. Re your questions. I don't fear thunderstorms. Hurricanes are another matter. As for pets, I am reminded of the time we had to evacuate for a hurricane, with a load of kids, grandkids, a dog and a ferret. Those final two had a great time on their impromptu vacation! We should all be so blessed with a rosy view of our troubles. Thank you for stopping in and leaving a note. Congratulations on your new release. I actually like thunderstorms, but my dog always hides under the bed. I love that name. About thunderstorms...they can be sneaky things. The sun can be shining where you are while a few miles away, the clouds are dark. Lightning can travel for miles! So, I'm happy to hear you do your watching from a safe distance. Hi, Linda! Welcome to the Dish! We're glad to have you here today. Congrats on your new release! What a coincidence! My husband, kids, and I moved to Atlanta 8 1/2 years ago from Tampa! We love it here, but do miss Florida sometimes, especially since we were all born and raised in Florida. I lived in Tampa for a few years. Worked on Westshore Drive! My husband if fifth-generation Floridan. Glad to hear Miles settled down. I think because dogs hear so much better than humans, it must be harder on their ears. My Jack sticks to me like glue when there's a storm. Linda, I have not been there, but I have heard of it!! If you get the chance to go, I highly recommend tubing. Here's a link with photos- and yes, it does look just that beautiful. Oh, and PJ is packed up and on the road to her new place of residence as I type this. She might be able to stop by later! I don't really fear thunderstorms,and I love to watch the rain. My niece has a dog that will get behind the toilet every time it storms because its so afraid of storms. Behind the toilet? Poor thing. Thank you for leaving a note. I hate thunderstorms. I don't mind the rain, but hate the lightning and the winds. Especially the tornadoes. I live in Iowa and is a fairly common occurence to have that happen. I lived in Kansas for a while, and tornados are very frightening. I'll take a hurricane over a tornado. Thanks for stopping in and leaving a note. Until I moved to Minnesota I'd never seen a real big thunderstorm. That changed real quick the first year I was there. Wow do they have some thunder and lightning! I put a big storm in my novel and made my characters have to slog through it out in the open until they found a cave. Because nothing says fun like putting your characters in the worst kind of situations! Thank you for leaving a note. :-) You are so right--torture those characters! lol. Once when I was in a car, it got struck by lightning. Lucky thing about cars, while they sit in rain during a thunderstorm, they have rubber tires and that grounds the car. The paintjob wasn't so lucky. But all inside were safe. Yes, I have what I consider to be a healthy fear of thunderstorms. Thank you for leaving a note and sharing about Maggie. It's one of my favorite names. I have a character named Maggie in a novel that I hope will see the light of day soon. Maggie's lucky she has you. Thanks so much for visiting with us today. Sorry I wasn't able to be here. As Andrea said, I closed on my house this morning, picked up the dogs at camp and headed up the road to my new place of residence. I'll close on my new place here next week. Still lots to do before I'm settled in! My two dogs are total opposites when it comes to storms. One crawls right into my lap (all 75 pounds of her) and hides her head. The other one sits in the window and enjoys the show! lol! Hi there! I am so happy to be here. Thank you for this opportunity. Moving is always stressful for me. Hopefully, you had good weather today where you were. Love the image of the difference between your pups! (Yes, I call all dogs, puppies.) Jack, my middle-sized dog, lets me know when storms are coming way before they arrive. That's helpful sometimes. lol. Again, I appreciate you and Andrea hosting me here. Several of our dogs in the past have been afraid of thunder. At the moment only one of the four is. She is an adult pit bull. When a storm is coming, she will sit next to me. When the thunder starts, she will usually be right at/on my feet. If the storm gets really bad, she starts whimpering. It's hard to comfort a whimpering pet. They're different from children that way. I love that you have four dogs. What a wonderful pack! I adore my 3. Some neighbors don't know my name, but they know I am Mom to Beau, Jack and Reni. Thank you again for hosting me. It's always fun hearing from readers. I appreciate the the opportunity to connect with new folks.